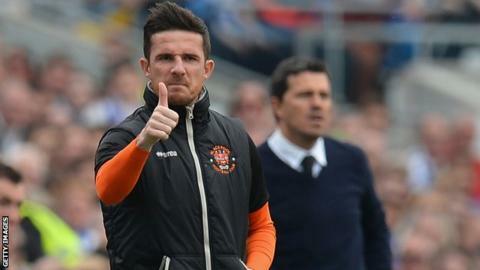 Former Scotland midfielder Barry Ferguson is leaving Blackpool after a spell as caretaker player-manager, the club has confirmed to BBC Scotland. The news comes the day after Dundee United denied the Seasiders permission to speak to their manager, the former Scotland defender Jackie McNamara. Ferguson took charge of Blackpool in January after Paul Ince's dismissal. While they only won three out of 20 games under the 36-year-old, they did avoid relegation by two points. But it is understood that Ferguson, who spent most of his playing career with Rangers, and chairman Karl Oyston did not see eye to eye. Ferguson has been quoted as saying that the club needs more investment in their squad to avoid another battle to avoid the drop from England's Championship. The Scot had warned that he might have to choose between concentrating on management with the Seasiders or continuing his playing career elsewhere. Ferguson, who also had spells with Blackburn Rovers and Birmingham City before joining Blackpool in 2011, is poised to have ankle surgery this summer. He becomes the second high-profile departure from the Seasiders this week, secretary Matt Williams, who ran their media and commercial departments, being appointed chief executive of Shrewsbury Town after their relegation to League Two. Oyston praised the outgoing team boss in an interview on his club website. "Fortunately, we're still a Championship club and you could say it's luck, but I think Barry and his team did very well to keep us in the Championship," he said. "They were arguably dealt a boorish hand, so it was touch and go. "We're looking for a manager, we need a full-time manager and Barry very kindly took over as a caretaker for us. "I think we probably need to go a different way than we have done over the past few years and look at all our options, which is what we're doing at the moment." Oyston spelt out the kind of manager he was seeking. "I think we need to make sure that whoever we get comes in and brings a fresh approach, style and emphasis," he said. "We're now lucky that we've got more opportunities to bring youth players through because we've got a good youth set-up that's going really well. "It would be a shame if we allowed a manager to come in that didn't take advantage of that and work and encourage the youth - and actually give them a chance in the team whenever we can. "I'd also like someone who does more work not just on the training pitch but more work with the players on fitness and brings them back in the afternoon for one-on-one sessions - and deals with injuries slightly differently. "I think it has been far too easy to be injured at this club over the last couple of seasons." Oyston also hoped to attract players willing to live in the Blackpool area. "Travelling two and three hours a day can't be good for a player," he said. "We're keen to make an early decision and involve any manager in the option decisions."